About Dr. Gottfried - Michael G.S. 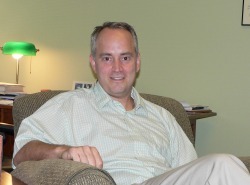 Gottfried, Ph.D.
Dr. Gottfried is a licensed psychologist in the state of Missouri. He received his Ph.D. in Counseling Psychology from Arizona State University and his Masters of Arts degree, also in Counseling Psychology, from Boston College. He received additional training in Systems Therapy at the Kantor Family Institute in Cambridge, MA during his Master's studies. Arizona State University (1999). Philosophy Doctorate (Ph.D.) in Counseling Psychology. Dissertation: "Attachment Style and Interpersonal Presentation in Counseling"
Boston College (1993). Masters of Arts (MA) in Counseling Psychology, Child and Adolescent Specialization. Kantor Family Institute (1993). Trained in Family Systems therapy (AAMFT Accredited).